We have visited this nature reserve in winter and in summer, and there is always something to see. The vista looking across the Dyfi Estuary in winter is vast; however, in summer, when all the reeds and plants are at peak growth, the aspects within the reserve really come into their own. 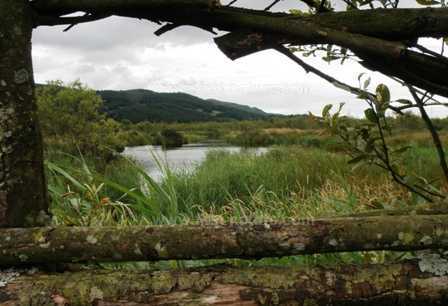 Then much of the wealth of wildlife at Cors Dyfi can be viewed at very close quarters from the boardwalks. Since a pair of Ospreys built a nest close to the reserve in 2007, there has been an increase in facilities there so that the general public can call in and learn more about these bird, and also observe them through binoculars and 'scopes set up in the new viewing tower inside the reserve. From 1st April each year, Montgommery Wildlife Trust volunteers and staff are on hand to help you to get the best from your visit to Cors Dyfi. Visitors to the site can now benefit from the new super-quality live video feeds that have been installed to watch the nest from the comfort of the extended Visitor Centre. Cors Dyfi is situated directly off the main A487 Aberystwyth to Machynlleth road close to the Morben Isaf Caravan Park. The reserve is open to visitors all the year round (although the Visitor Centre building is closed during the winter months). A circular boardwalk through the reserve is suitable for wheelchair users and for prams and pushchairs. 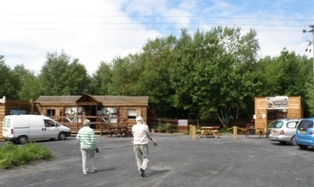 There is a Visitor Centre with a small shop and a new (for 2012) Coffee Shop which is manned from 1st April when the Dyfi Osprey Project opens to the public; the Centre has a disabled toilet. There is also a viewing tower for public use, which has binoculars trained on the Osprey's nest. Cors Dyfi is part of the Dyfi Estuary. Because of this, although the process of siltation which has built the land up to a height above sea level and resulted in the landscape we see today, the reserve is still prone to flooding during high tides. 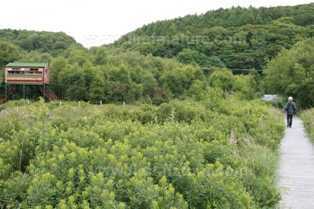 The site has been used as a tree plantation and as grazing over the years, but under the management of Montgomeryshire Wildlife Trust there is now a mosaic of wildlife habitats which include bog, scrubland with gorse, swamp, and wet woodland where native trees such as willow, alder and silver birch are making a comeback. The resulting increase in wildlife diversity in the reserve is impressive. Since the start of the Osprey Project in 2009, Cors Dyfi has become best known for its birds, but there is so much more to see there. The plantlife includes Marsh Cinquefoil (Comosum palustre), Purple Loosestrife (Lythrum salicaria), Lesser Spearwort (Ranunculus flammula), Royal Fern (Osmunda regalis) and Bog Myrtle (Myrica gale) and many others. This wealth of plants means that there is also a wide range of invertebrates on the reserve, and in summer the air is alive with the buzzing of insects as well as the singing of the numerous birds that live and breed at Cors Dyfi. This marvellous reincarnation has resulted in over 100 species of moths being recorded on site, including the Saltern Ear Moth (Amphipoea fucosa ssp. paludis) which is mainly distriuted in coastal areas; the adults can be seen flying in August and September, and their larvae feed inside the roots and stems of various types of grasses that are found at Cors Dyfi. As with most good bird nature reserves the early morning is the best time to visit; however, once they arrive the Ospreys (Pandion haliaeteus) can be seen flying back and forth to their nest throughout the day. Reports of Ospreys breeding in and around the River Dyfi have been commonplace over many years, but it was in 2007 that a pair built a nest on a platform constructed by Montgomeryshire Wildlife Trust. Ospreys have returned to this spot every year since then, but it was not until 2011 that a pair successfully raised a family. The reason for this is not clear although the various theories put forward include the possibility that the birds were too young and inexperienced to raise a family, or that if born in the same area themselves they may have been too closely related. Ospreys notwithstanding, there are many other birds to see at the reserve including various warblers, Green Woodpeckers (Picus viridis), Nightjars (Caprimulgus europaeus), Hen Harriers (Circus cyaneus), Peregrine Falcons (Falco peregrinus) and Red Kites (Milvus milvus). Green Woodpeckers are less common in most parts of Wales than they are in other regions of the UK and so it is always special to see and hear them at Cors Dyfi. If your interest is in mammals Cors Dyfi will not disappoint in that area either: both Otters (Lutra lutra) and Dormice (Muscardinus avellanarius) have been recorded at the reserve.